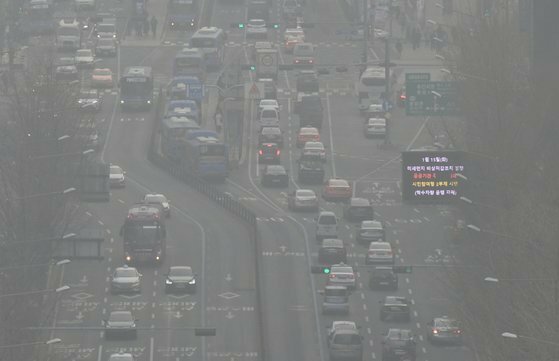 South Korea is set to host the World Health Organization’s Asia-Pacific Center for Environment and Health, amid growing concerns over worsening air pollution and environmental problems in the region. Environment Minister Cho Myung-rae, Seoul Mayor Park Won-soon and Shin Young-soo, the WHO regional director for the Western Pacific, signed a memorandum of understanding to establish the center in Seoul on Tuesday. The center, which aims to tackle challenges arising from climate change and to boost public health in the West Pacific region, will open in May at the Seoul Global Center building in downtown Seoul. The center plans to gather scientific evidence on the health risks posed by environmental pollution and climate change, and help member states in the region draw up policies to address such risks and enhance public health. Its research areas include solutions to fine dust and yellow dust being generated and traveling across borders in Northeast Asia, and the establishment of a health care system in island countries that are more vulnerable to climate change. “We hosted the WHO center equipped with scientific, global perspectives and expertise in order to make society healthy and free from environmentally harmful elements, such as fine dust, harmful chemical material and climate change,” Environment Minister Cho said at the signing ceremony. Seoul Mayor Park also said the city will strive to help the WHO center in Seoul become a hub for regional efforts to fight environmental problems by utilizing its networks with 31 international organizations based in the city. The Ministry of Environment and Seoul Metropolitan Government will provide the WHO center with funds worth 940 million won and 500 million won, respectively, for the first year, according to the ministry. The ministry will increase its financial support to 1.9 billion won if the parliament approves the budget, and the Seoul city government will offer about 500 million won from the second year. The center will receive $17.85 million from 2019 to 2023 from the Global Environment Facility, and will try to secure extra funds worth 3.8 billion won every year, according to the ministry. South Korea applied to host the center in January last year after the WHO’s West Pacific regional committee agreed to establish a center aimed at promoting environment and health in 2017. Seoul became the first city in the Asia-Pacific region to host the center. The WHO European Centre for Environment and Health was established in 1991 in Bonn, Germany.